[Rebecca Malambo – Diocese of Cape Town] St George’s Cathedral choir conductor Jonathan Langenhoven travelled to England with his wife Susan in September 2018 to receive an award from the Royal School of Church Music (RSCM) in recognition for his services to church music. 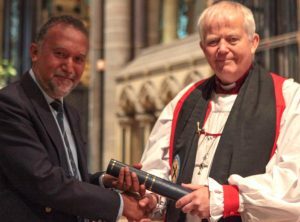 He was honoured as an associate of the RSCM during a celebration service at Salisbury Cathedral on September 8th. The award was presented to Jonathan by the Rt Revd Nick Holtam, bishop of Salisbury. Jonathan was one of 9 recipients of the ARSCM award for 2018 and the only recipient from Africa this year. The RSCM is an international organization, with headquarters in the UK, which aims to encourage and support music in churches. It is represented in the UK, USA, Australia, Canada, New Zealand and South Africa.